The care you need, wherever you are. When you're far from home, a medical emergency is the last thing on your mind. But if it happens, we're here to help. Our Global Patient Services (GPS) program coordinates patient transfers and evacuations from around the world to a Sharp HealthCare hospital in San Diego. Care starts with our experienced bilingual team, qualified with more than 30 years of experience. We work closely with travel insurance and assistance companies, cruise lines, government agencies and other organizations to manage all facets of your emergency. And being so close to the border, we have close working relationships with medical professionals in Mexico. A GPS transfer liaison is available 24 hours a day, seven days a week, to assist with medical evacuations of patients to a Sharp hospital. To request assistance with an evacuation, please call 858-499-4102 or send us an email. Sharp GPS does not sell travel insurance or provide vaccinations required for foreign travel. Information about planning your trip and emergency medical evacuation support. How Sharp can help you navigate a medical emergency. 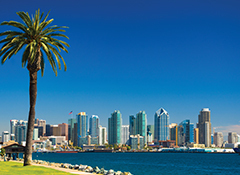 Learn about Sharp's mission as San Diego's leading health care provider. Get information on what to do before traveling abroad at this free event.